Currently, we're in my favourite period of the year. The transition from Summer to Autumn is magical. The air is crisper, the leaves get darker and I get to walk around in witchy cloaks. What's not to love? 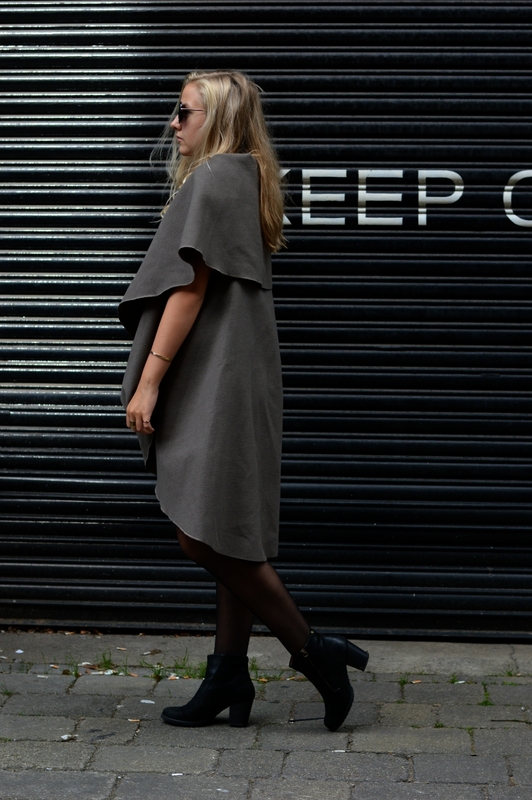 When Luxemme contacted me and offered me an item from their site of my choosing, I couldn't resist this grey cloak/cape. It's a key element of my favourite transition outfit. The formula is a black playsuit, gold jewellery, some chunky boots and a statement cloak. It gives that perfect witchy vibe and works for pretty much any occasion. You may have also noticed the black streak in my hair. That's a feather I got in a French market at the end of the Summer. When you hold it to the light it has this beautiful jade green glimmer and it's become one of my favourite things. Despite the negatives of Autumn, such as the end of Summer and the start of school/work, there's something about the atmosphere that I've always loved. The regression back to comfortable temperatures, the colours and the way that everything just seems a little more magical. It makes starting school just a little bit easier.